While most of what I shoot is generally classified as landscape or nature photography, I’ve always been intrigued by macro work. Since photography is only a part time thing for me sometimes real life dictates that I can’t always just take off and head to Yosemite on a whim. On those occasions I sometimes spend the afternoon “playing” with a macro lens. There’s something really interesting about seeing ordinary things on an extraordinary scale. Scratches become valleys, specs of dust become boulders, peppercorns become asteroids. There are so many details, in every day objects, that we just don’t see. Ironically macro photography, in my aquarium, was really what reignited my interest in photography. Macro photography, by definition, is magnification of 1:1 or higher. What the ratio refers to is the size of the image projected onto the film plane or image sensor. An object at 1:1 magnification is the same size as it’s projection. At 2:1 it’s the projection is twice the size of the object in real life. Getting to 1:1 magnification generally requires some special equipment. Zoom lenses, such as my Canon 24-70 f/2.8 often say “macro” on them but that only means that they have a shorter minimum focusing distance than a non-macro version. None of the zoom lenses in that category, that I’m aware of, will get to 1:1 and therefore aren’t truly macro lenses. Generally speaking to get a true macro lens you’ll need a prime, (non zooming), lens. My favorite is the Canon 100mm f/2.8. There are other ways to get to 1:1 magnification, which is really the point of this article…. Extension tubes, which are really just spacers between lens and camera body, decrease a lenses minimum focusing distance which increases magnification. The trade off is some loss of light and the loss of the ability to focus at distant objects. I frequently carry a set of Kenko extension tubes just in case I want to get closer to something. Another practice involves using a reversing ring to mount a lens backwards on the camera. While it sounds odd, it works really well with lenses in the 20-50mm range. One trade off, if it’s a modern lens, is that you loose the electrical connection, between lens and body, so you can’t control aperture. One solution is to buy an old manual lens for that purpose. Being a lifelong technology geek, that’s a solution that just didn’t sit well with me. Behold Frankenlens. This project only took me a couple of hours to do the work but I will confess to spending much of the day tinkering with it. I started with an old EF-S 18-55mm lens. 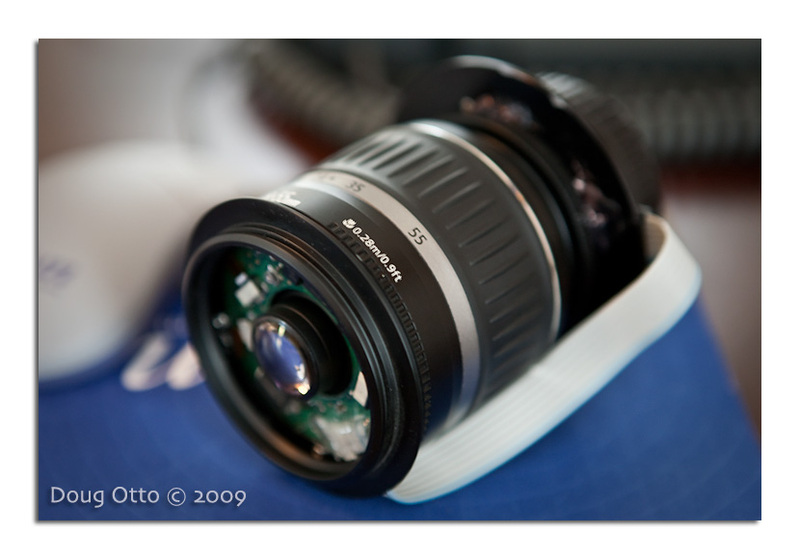 This is the lens that used to come as the standard “kit” lens with the Digital Rebel. It’s a cheap, consumer grade lens. Being an EF-S mount it doesn’t fit on my Canon 5D so it’s just been gathering dust. I got the wild idea that it would be fun to see if I could get the lens to mount, reversed, and still have electrical control from the camera body. I started by removing the lens mount and modifying it to make it the same size as a standard EF mount. Once that was done I installed a ribbon cable between the lens mount and the lens. Using an old filter as a spacer, I attached the front of the lens to the modified lens mount. On, what used to be the back of the lens, I added a mounting plate for my Canon MR-14EX ring flash. A few dabs of hot glue to keep cables from moving around and it was done. The image at the top of this article is my son’s pocket knife blade at right around 3:1 magnification. With the lens at 55mm it’s roughly 1:1. It’s not going to win any beauty contests but I am very pleased with how well it works. While auto focus still technically works, it wasn’t designed to work on that scale so it’s a bit sketchy. Aperture control, however, works perfectly. The lens even reports itself correctly in the [wikipop]EXIF[/wikipop] information. For a lens that is worth about $50 it does an amazing job. I’m looking forward to spending a few lazy afternoons exploring the world with it, in the comfort of my home office. This entry was posted in Photography and tagged 18-55 EF-S, blade, Canon, DIY, macro, reversing ring. Bookmark the permalink.